I’m throwing a virtual holiday party, and you’re invited! It’s time to get into the holiday spirit, Italian style. Join me! Today I’m bringing you two recipes – yes, two! – inspired by my recent trip to Italy that make entertaining easy, economical and tasty. My criteria for a great dinner party is simple: awesome people, a killer playlist and delicious food that requires little last-minute fussing. Both of these recipes come together super fast and can be easily assembled right before serving, so you’ll have more time to spend with those awesome people you invited over. And guess what? At the end of this post, you’ll have the opportunity to win a gourmet food basket loaded with lots of incredible Italian ingredients to help you get the spread on the table. I told you it was a party, didn’t I? The giveaway is coming courtesy of Colavita and Perugina, two high quality Italian companies with products I’ve been a big fan of for a long time. Last month, they shipped me a box packed to the gills with different olive oils, balsamic vinegar, pasta, polenta, olives, artichokes, tomatoes, chocolate and more. With that, they challenged me to create two recipes – one sweet, one savory – using five of the ingredients provided. Today, I’m sharing those recipes with you along with a chance to win that same box of goodies. And trust me, you definitely want to win! This pasta recipe is a mash-up of a few different dishes I had back in September when we were traveling through Tuscany. I combined sweet Italian sausage, savory Colavita crushed tomatoes and creamy mascarpone cheese to make a velvety sauce that gets tossed with perfectly al dente Colavita pasta. A finishing sprinkle of finely chopped walnuts adds a unique flavor and textural contrast that’s a welcome change from the usual grated cheese. To me, this dish is exactly what Italian food is all about: top quality ingredients, proper technique, and simple, well balanced flavors. Colavita tomatoes have the perfect balance of sweetness and acidity, while the mascarpone adds a certain funk you can’t get from using plain old heavy cream. The sausage gives it tons of flavor, with just enough protein to make it a meal. Most of this dish can be made ahead, making it perfect for serving to company. When it’s time for dinner, all you have to do is cook the pasta and toss it all together. Boom! For the dessert portion of the challenge I opted to make panna cotta, an Italian dessert that stole my heart while dining cliffside in the Cinque Terre. Panna cotta sounds so foreign and fancy, but it’s actually really simple and quick to make. The only hard part is having to wait at least six hours while it sets up in the fridge. It might just be the longest six hours of your life, but in the end it will all be worth it (pinky swear). 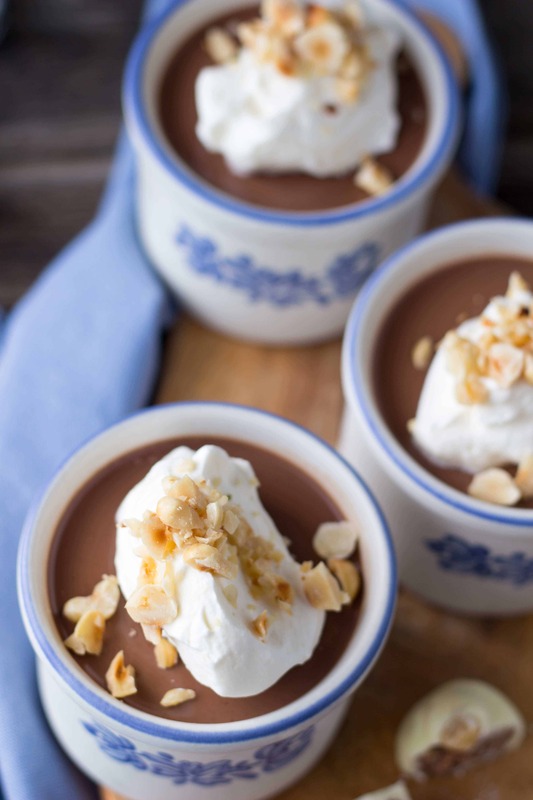 Panna cotta is essentially the Italian version of Jello pudding… which is to say that it’s made with much better ingredients, and it tastes a whole heck of a lot better. 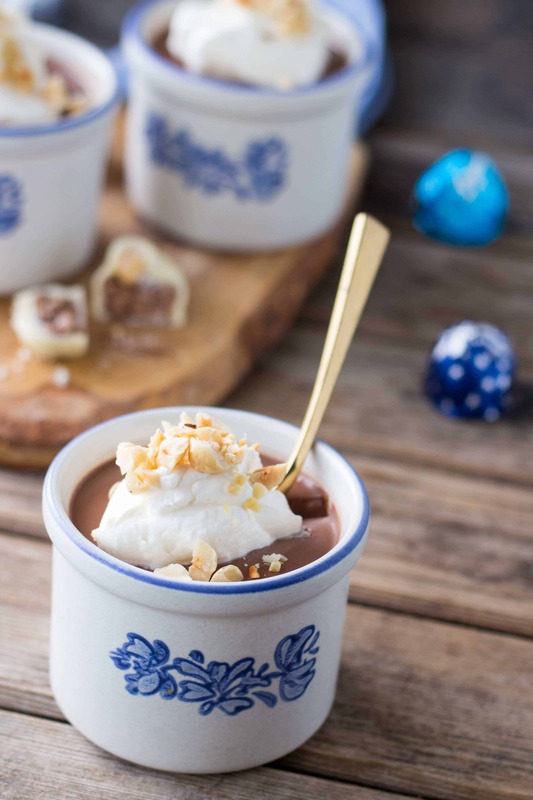 This recipe mixes Perugina dark chocolate, hazelnut liqueur and chocolate hazelnut spread to create a luxurious and rich pudding. Inside, there’s a surprise: little pieces of chopped up Baci candies. If you’ve never tried Baci before, they can only be described as a chocolate hazelnut lover’s dream. Rich gianduja – a chocolate hazelnut cream – is topped with a single toasted hazelnut and enrobed in either dark, milk or white chocolate. Make sure you get more than you need for this recipe, or you’ll run the risk of eating them all before they make it into the bowl (Guilty!). Start off the meal with some easy store bought apps like olives, a selection of cured meats and cheeses, or this easy recipe for maple rosemary pecans. Then, round it all out with a simple green salad, a loaf of crusty bread and of course plenty of good Italian wine. Okay, now for the fun part! Wanna win a package of great quality, authentic Italian products just like the ones I used to create these recipes? Of course you do! Click here to fill out the form – it will only take a few minutes – and if (when) you win, just let me know what time to be over for dinner. Good luck! Special thanks to Colavita and Perugina for sponsoring this post. All opinions are 100% my own. Heat Colavita Organic Extra Virgin Olive Oil in a large saute pan, then add in the sausage. Use a spatula to break up the sausage as it cooks, working it until it’s in pieces the size of peas. When the sausage is fully cooked, add the whole garlic cloves and cook for one minute. Add the Colavita crushed tomatoes and let simmer for 5-10 minutes. While the sauce is cooking, bring a large pot of water to a rolling boil and add a generous amount of salt (it should taste almost as salty as the ocean). Drop in the Colavita pasta, give it a stir, and cook until al dente. While the pasta cooks, lower the heat of the sauce and stir in the mascarpone until blended. Remove the garlic and discard. When the pasta is ready, drain, then add to the sauce and toss for a few minutes until fully coated. Top with chopped walnuts and serve hot. Pour the water in a medium bowl, sprinkle the gelatin over top and stir to combine. In a medium saucepan, bring the heavy cream up to a boil and then remove from the heat. Add the chocolate and salt, then stir until the chocolate has completely melted. Pour the mixture over the gelatin and gently whisk until combined. Whisk in the hazelnut spread, hazelnut liqueur and milk, then set the mixture aside to cool slightly. Place about 1 heaping tablespoon of chopped baci in the bottom of 6 ramekins or cups, then pour the mixture over to cover. Cover the ramekins loosely with plastic wrap and place in the refrigerator for at least 6 hours (preferably overnight) to set. 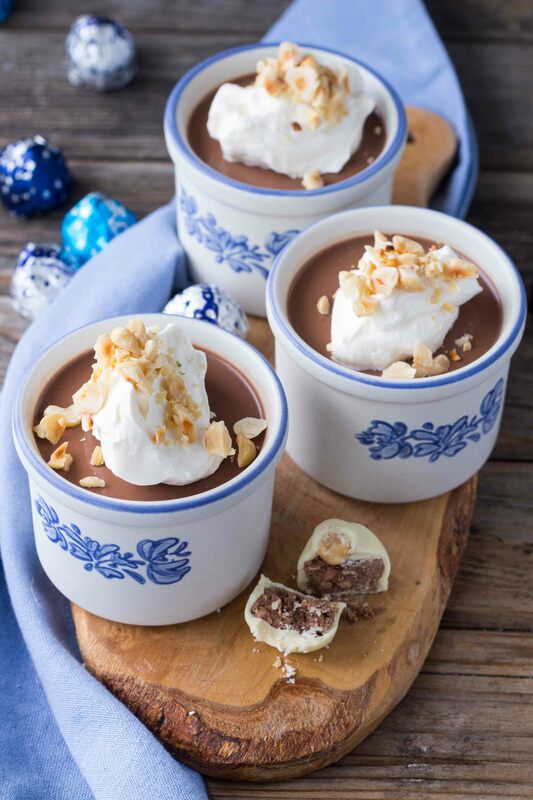 To serve, top with a dollop of whipped cream and chopped toasted hazelnuts. Oh MAN!!! I gotta stop reading your posts on my fasting days!! These are KEEPERS, Coley! LOVE everything about them (and it’s not just my empty stomach talking here)! My kids LOVE Nutella and I LOVE Frangelico so the dessert is a definite ‘go’… The pasta also sounds absolutely luscious! Thanks for sharing! Awesome!! I know you’ll love them both – we certainly did! Italians. Holiday spirit. Adorable dishes. And mascarpone pasta. 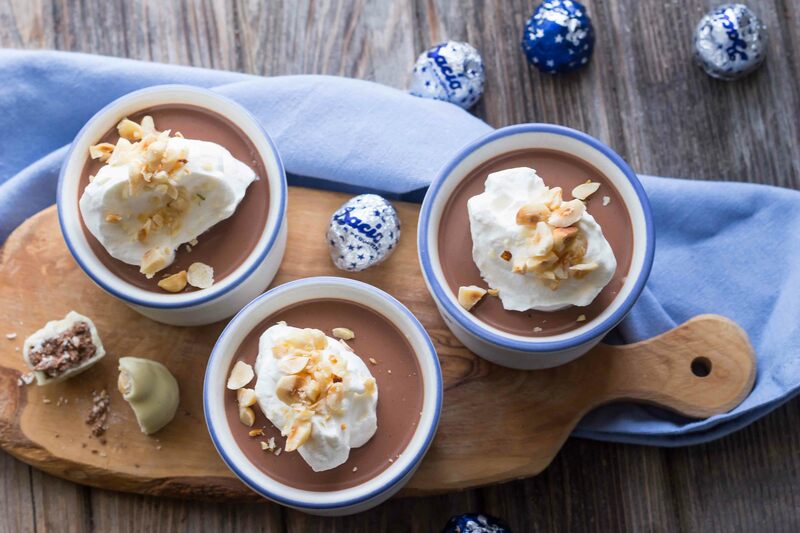 Chocolate Hazelnut Baci Panna Cotta. Dude. Ain’t no party like a Coley party ‘cuz a Coley party don’t stop! 😉 These look phenomenal lady. Drooling. Also going to stalk you on Instagram now. Haha! This might just be my favorite comment ever. Thanks for stopping by and also for following on insta. Stoked to stay in touch! That panna cotta is getting to me. So silky! Also, so jealous! I love Italy but haven’t been in years 🙁 Someday! Thanks, Ashley! And, yes, you absolutely must get back to Italy. It’s an amazing place!